Finding the perfect vase to put them in. Pretty nice of them, right? Gorgeous photos! So perfect as we wait for spring. Thanks Courtney beautiful vases aren't easy to find unless you spend big money. I love to see how you stage your photos! The spray of the tulips matches the spray of the wheat sheaves....and the flowers on the pillow...nice going, Courtney!!! I really loved the vase, tooooo! I didn't notice that! :) funny! 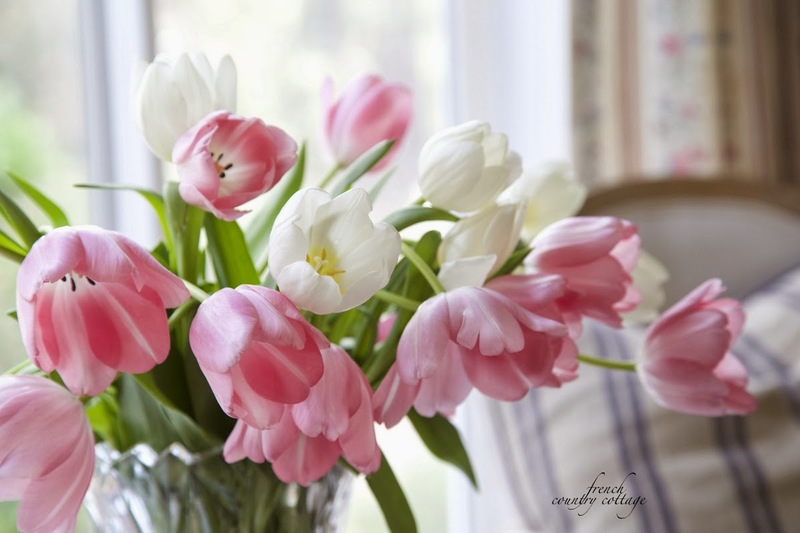 Courtney, those tulips look gorgeous in the beautiful vase! A surprise gift is so surprising!!!! And when it's so beautiful as your new vase, it makes the surprise even greater!!! The tulips are such a gorgeous color!!! I know by visiting Seattle, that your prices for beautiful flowers are so much better than up here in Canada. You always have the most gorgeous flowers on display!!! If you place a copper peony in the water the tulips won't droop so much! Lovely vase. I live in Tulip country, Skagit Valley, Washington. We have the annual Tulip Festival, you might want to look it up, field after field of tulips! I would love to have this lovely vase for the orchid blooms I purchase at my wonderful village florist,Sorella, here in contoocook, New Hampshire! Awww.. I don't have a FB or a pinterest account :( Any other way I can enter? Your comment is an entry. Tulips are my favorite! We used them as the centerpieces at our wedding reception. But I digress....this Mikasa vase is beautiful. I have an old chipped vase I use right now. Would love to upgrade! I have always liked Mikasa. Our wedding crystal is Mikasa. It was from Macys on our gift registry 25 yrs ago! This is beautiful, Courtney. Sometimes you have to get away from the rustic, as much as we love it, and add some elegance. 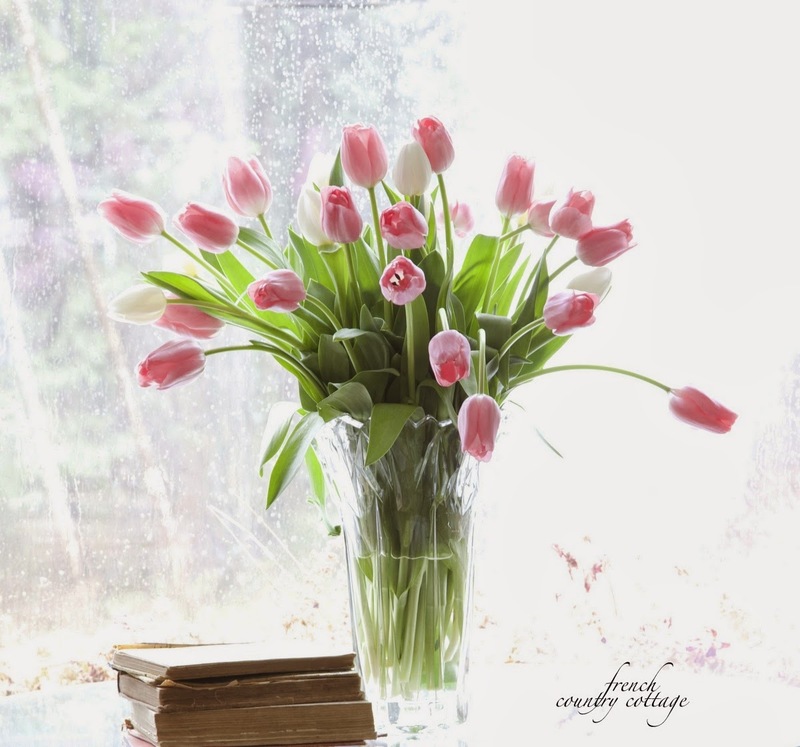 Tulips are beautiful in this vase. Following everyone on FB! It'll be nice to keep up with you! 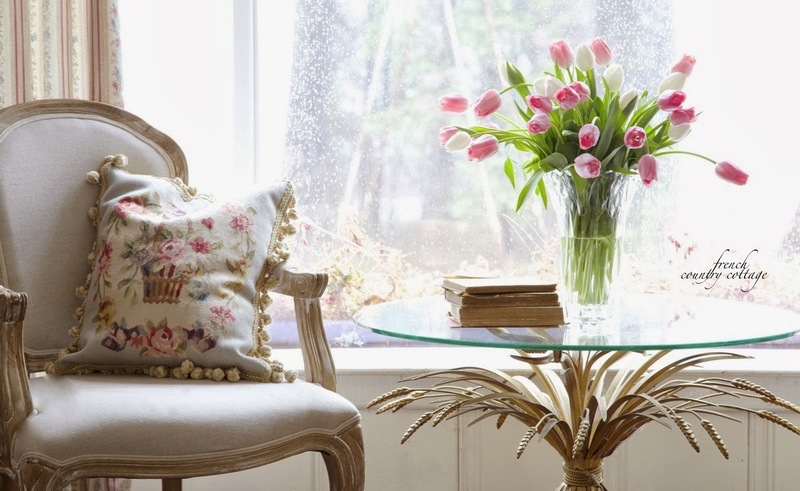 Oh, I cannot live without flowers, in every room!! Those tulips are wonderful!! Very inspiring! Love that vase. Your pictures are always so beautiful. And I love the shape of the vase. Thank you! The vase is truly a classic and how beautiful it looks on that magnificent table...such a gorgeous photo Courtney! 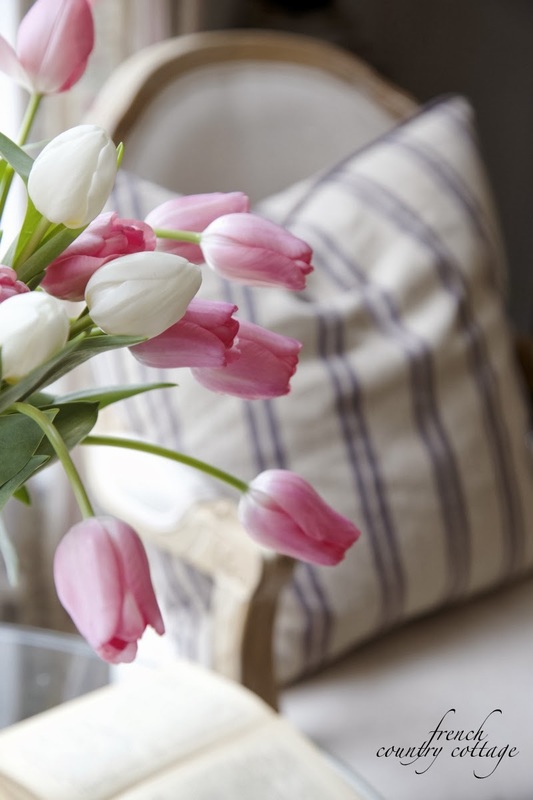 I love the look of tulips. I can't wait until mine come up. That vase is gorgeous, too. If I were lucky enough to win, then I would celebrate by buying my own tulip bouquet. Thanks for the chances to win. I love this blog so much! I already follow you on facebook, can I mark that? 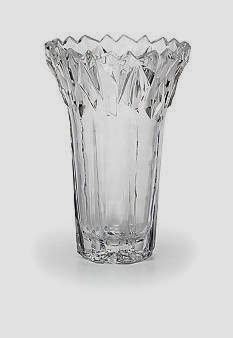 What I also love about a leaded vase, outside of the graceful design of this particular vase, is that my cats won't be able to knock it over as easily when they are drawn to its beauty. (And the water inside....) Thank you Courtney and Mikasa. Yes- that is fine! It should have a place to enter saying you follow - I think Rafflecopter changed a few things since I used it last so not sure- but they usually do have a spot for easy entry for fb follower. Beautiful, beautiful!! Your blog is my happy place!! Thanks, Courtney! By the way, I love tulips. I recently learned a neat trick to keep them upright. 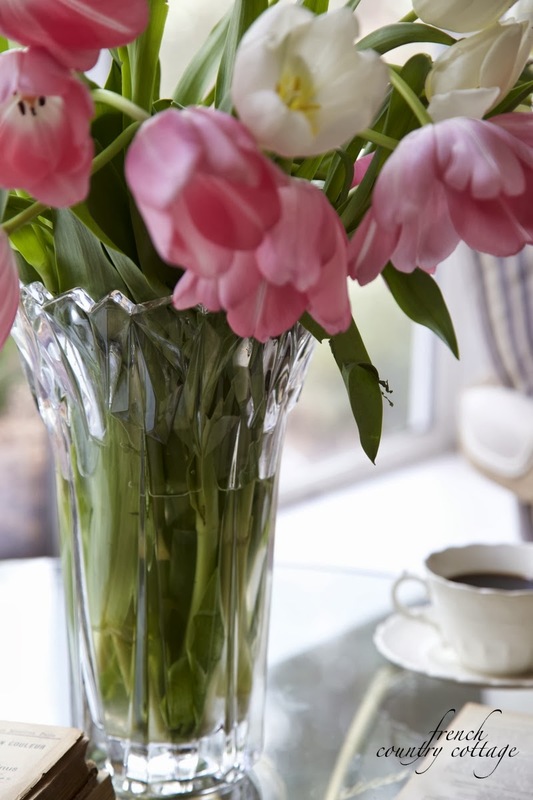 simply throw a few pennies in the vase - voila! 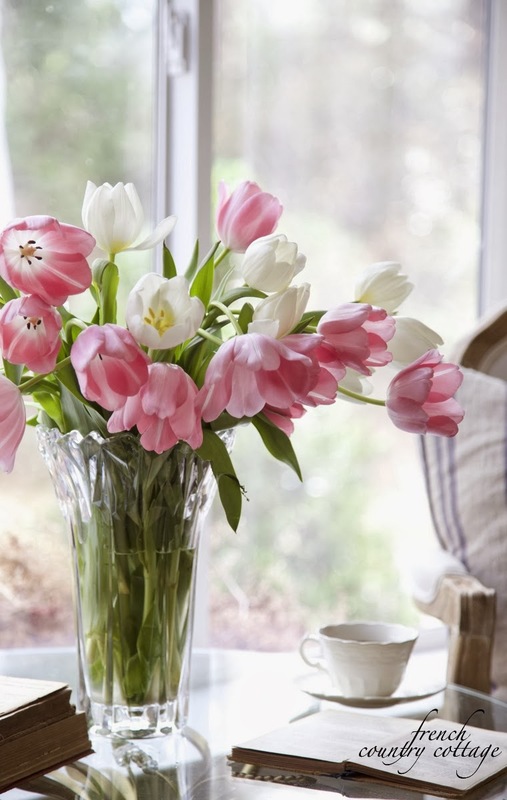 Such gorgeous tulips and vase! Thank you for offering this beautiful give-away! So pretty! Looking forward to Spring...Heartfelt thanks to you! Courtney, the vase is so elegant. Filled with beautiful tulips makes it all the more so. Thanks!